Liferay’s Message Boards portlet is a state of the art forum application similar to many forums in which you may have participated. The difference, of course, is that Liferay’s message boards can inherit the abilities of the Liferay development platform to provide an integrated experience that others cannot match. There are countless web sites out there where it is clearly evident that there is no link whatsoever between the main site and the message boards. In some cases, users are even required to register twice: once for the main site and once for the message boards. Sometimes it is three times: for the site, for the message boards, and for the shopping cart. By providing a message boards portlet along with all of the other applications, Liferay provides a unique, integrated approach to building web sites. You can concentrate on building your site while Liferay does the integration work for you. The Message Boards portlet offers many configuration options. They are straightforward to use and are the reason why this portlet is a full-featured forum application for your web site. To get started, add a Message Boards portlet to your site. Once it is added, click the Menu icon in the portlet’s title bar and click Configuration. There are two rows of tabs. The first tab in the top row is titled Setup. This is where you can configure the application the way you want it to behave on your site. The first tab beneath Setup is labeled General. Here, you can enable anonymous posting, subscribe by default, flags, ratings, and thread as question by default. You can also choose whether you want the message format to be BBcode or HTML. Anonymous posting, subscribe by default, flags, and ratings are selected by default and the default message format is BBcode. Enabling Allow Anonymous Posting allows users without an account on the system to post messages to your message boards. Whether or not you you’ll want to do this depends on the type of community you are building. Allowing anonymous posting opens your site to anyone who might want to spam your forums with unwanted or off topic advertising messages. For this reason, most of those who implement message boards turn anonymous posting off by unchecking this box. Enabling the Subscribe by Default option automatically subscribes users to threads they participate in. Whenever a message in a thread is added or updated, Liferay sends a notification email to each user who is subscribed to the thread. You can set the Message Format to either BBCode or HTML. This determines the markup language of users’ actual message board posts. Different WYSIWYG editors are presented to users depending on which option is enabled. Both editors have a Source button which allows users to view the underlying BBCode or HTML of a message. Users can compose messages using either the WYSIWYG or Source view and can switch between views during message composition by clicking on the Source button. Enabling Enable Flags allows your users to flag content which they consider to be objectionable. If you are allowing anonymous posting, you might use flags in combination with it if you have someone administering your message boards on a day-to-day basis. That way, any unwanted messages can be flagged by your community, and you can review those flagged messages and take whatever action is necessary. Using flags is also a good practice even if you’re not allowing anonymous posting. Enabling Enable Ratings enables your users to give certain posts a score. This score is used by Liferay Portal’s social activity system to rank your site members by how helpful their contributions are. You can read more about social activity later in this chapter and in chapter 9. Enabling the Thread as Question by Default option automatically checks the mark as question box in the new thread window. Threads marked as questions display the flag “waiting for an answer.” Subsequent replies to the original message can be marked as an answer. This tab allows you to configure the name and email address from which message board email notifications are sent. The default name and email address are those of the default administrator account: The name is Test Test and the email address is test@liferay.com. Make sure to update this email address to a valid one that can be dedicated to notifications. This tab allows you to customize the email message that users receive when a message is added to a topic to which they are subscribed. Enabled: allows you to turn on the automatic emails to subscribed users. Uncheck the box to disable the message added emails. Subject Prefix: lets you choose a prefix to be prepended to the subject line of the email. This is usually done so that users can set up message filters to filter the notifications to a specific folder in their email clients. Body: allows you to write some content that should appear in the body of the email. Signature: lets you add some content to appear as the signature of the email. Below the fields is a section called Definition of Terms which defines certain variables which you can use in the fields above to customize the email message. Some of these variables are for the message board category name, the site name, and more. The Message Updated Email tab is identical to the Message Added Email tab, except it defines the email message that users receive whenever a topic is updated. You can define custom priorities for message threads on this tab. These allow administrators to tag certain threads with certain priorities in order to highlight them for users. By default, three priorities are defined: Urgent, Sticky, and Announcement. To define a thread priority, enter its name, a URL to the image icon that represents it, and a priority number which denotes the order in which that priority should appear. There is also a field on this form that allows you to select a localized language for your priorities. If you need to do this, you can select the language from the selection box. On this tab, users can be ranked according to the number of messages they have posted. You can set up custom ranks here. Defaults have been provided for you, going from zero messages all the way up to one thousand. In addition to ranks, you can also choose labels for certain users to have displayed in their profiles as shown by the Message Boards application. These labels correspond to memberships these users have in your portal. Below are examples of using the label Moderator. The Moderator label in this configuration is applied for anyone who is a part of any of the Message Boards Administrator groups: the site role, the organization, the organization role, the regular role, or the user group. Of course, you probably wouldn’t want to create a role, organization, organization role, site role, and user group all with the same name in your portal, but you get the idea. As you can see, all you need to do is set the rank, the collection type, and the name of the type. In the example above, anyone who has a site role, an organization role, a regular role, or is in a user group called Message Boards Administrator, or anyone who is the organization owner gets the moderator rank. As with thread priorities, on this tab you can define whether your ranks are localized in a particular language. Message board threads can be published as RSS feeds. This tab allows you to define how the feeds are generated. Maximum Items to Display: lets you select the number of items to display in the feed. Display Style: lets you select the style. You can publish the full content, an abstract, or just the title of a thread. Format: allows you to choose the format: RSS 1.0, RSS 2.0, or Atom 1.0. The default page that the Message Boards portlet displays has three buttons on it. Click the one labeled Permissions. This allows you to define which roles have the ability to add a category of threads or to ban abusive users from the message boards. 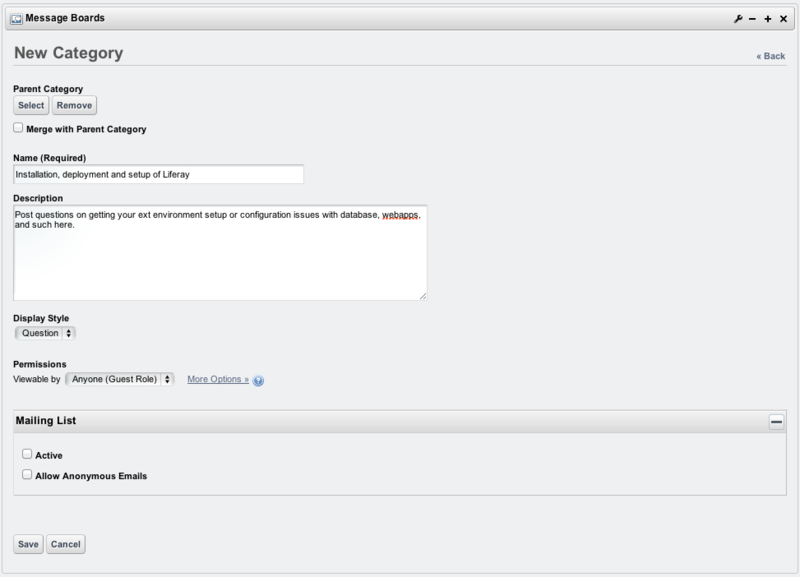 Select the roles and permissions you want to configure and then click Submit. You are now ready to add categories to your message boards. Click the Add Category button. You may merge with a Parent Category by enabling the Merge with Parent Category check box and clicking the Select button. Enter a name for the category and a description of the category. Default: classic display style for general purpose and discussions. Question: designed for discussions in a format of questions and answers. You can add as many categories to your message boards as you wish. As we saw above, categories can have subcategories. You can add any number of top-level categories to a message board. You can also edit any category and add subcategories to an unlimited level. For usability reasons, you don’t want to nest your categories too deep, or your users will have trouble finding them. You can always add more categories as your message boards grow. Finally, each category can have any number of threads. At the bottom of the form for creating or editing a message board category is a check box for enabling the mailing list function. If don’t want to add a mailing list to the category you’re creating, click Save now. You can always edit an existing category to add, edit, or remove a mailing list. Liferay’s Message Boards portlet supports two different mechanisms for sending email notifications: user subscriptions and mailing lists. Let’s discuss user subscriptions first and then mailing lists. As this property suggests, Liferay’s message boards user subscription mechanism uses the POP mail protocol. When an email reply to a message board notification is read by Liferay, the reply is posted to the message board and then deleted from the mail server. Deleting the message from the mail server is the POP protocol’s default behavior and Liferay assumes that your POP mail server behaves this way. Most POP clients offer an option to leave mail on the mail server after it’s been downloaded but you shouldn’t exercise this option. If you configure mail to be left on the mail server, Liferay will repeatedly send copies of each retained message along with each new email notification that’s sent to subscribed users. This property creates a special MX (mail exchange) subdomain to receive all portal-related email (e.g., events.liferay.com). If you don’t want to use the subdomain approach, you can unset this value to tell Liferay to use the Email From address specified in the portlet preferences to receive message board notification email replies. For example, the Email From address could be set to *replies@liferay.com*. If you’re not using a mail subdomain, Liferay parses the message headers of emails from the Email From address to determine the message board category and message ID. If you keep the pop.server.subdomain=events default, the email notification address takes the following form: mb.[category_id][message_id]@events.liferay.com. In this case, Liferay parses the email address to find the category and message ID. Parsing the email address is safer than parsing message headers since different email clients treat message headers differently. This is why the events subdomain is enabled by default. The second mechanism Liferay uses for sending email notifications is mailing lists. Any category in a Liferay message board can have its own mailing list. Liferay’s mailing list mechanism, unlike its user subscription mechanism, supports both the POP and the IMAP protocols. POP is the default protocol but each message board’s mailing list is configured independently. If you choose the IMAP protocol for a category’s mailing list, make sure to configure the IMAP inbox to delete messages as they are pulled by the email client that sends messages to the users on the mailing list. Otherwise, each email message that’s retained on the server will be sent to the mailing list each time there’s a new post or an update in the category. When a mailing list is enabled for a message board category, Liferay listens to the specific email inbox that’s configured for the mailing list. Enabling the mailing list function allows users on the mailing list to simply reply to the notification messages in their email clients. Liferay pulls the messages from the email inbox it’s configured to listen to and automatically copies those replies to the appropriate message board thread. With both user subscriptions and mailing lists, users can reply to message board notification emails and Liferay imports their replies to the message board. However, with mailing lists, users reply to the mailing list and Liferay listens to the specific inbox configured for the mailing list and copies messages to the appropriate message board category. With user subscriptions, by default, email replies to message board notifications are not imported to the message boards. This feature has to be enabled in your portal-ext.properties file. Once this feature has been enabled, users can reply to a specific address and have their replies copied to the message board. Note: Since any number of sites can use a globally scoped message board, globally scoped message boards do not support user subscriptions or mailing lists. Make sure to use a site-scoped or page-scoped message board if you need user subscriptions or a mailing list with your message board. To enable the mailing list functionality for a category, you need a dedicated email address for the category. Once you click the Active check box, a number of other options appear. When a mailing list is activated, Liferay imports messages it receives from the mailing list to the message board. Liferay looks for a Liferay user with the sender’s email address. If the sender isn’t a Liferay user and the Allow Anonymous Emails box is unchecked, the message is thrown away and not posted to the message board. If the Allow Anonymous Emails box is checked, anyone can send email to the message board category’s dedicated email account and Liferay copies the messages to the message board. Email Address: lets you enter the email address of the account that will receive the messages. Protocol: lets you select POP or IMAP. Server Name: lets you enter the host name of the mail server you are using. Server Port: allows you to specify the port on which your mail service is running. Use a Secure Network Connection: lets you use an encrypted connection if your server supports it. User Name: lets you enter the login name on the mail server. Password: lets you enter the password for the account on the server. Read Interval (Minutes): allows you to specify how often Liferay will poll the server looking for new messages to post to the message board. Email Address: lets you enter the email address that messages from this category should come from. If you want your users to be able to reply to the categories using email, this should be the same address configured on the Incoming tab. Use Custom Outgoing Server: allows you to use a different mail server than the one that is configured for the portal. If you check this box, more options appear. Server Name: lets you enter the host name of the SMTP mail server you are using. Use a Secure Network Connection: allows you to use an encrypted connection if your server supports it. Password: lets you enter the password for the account on the mail server. When you’re finished configuring the mailing list for your category, click Save. Upon seeing Liferay’s Message Boards portlet, your users will immediately recognize that the interface is similar to many other implementations they’ve seen before. Message boards are nothing new to the Internet, and many people have been using them for quite a long time. For that reason, Liferay’s message boards will seem very familiar to your users. Threads can be viewed in many ways. At the top of the portlet is a set of tabs: Recent posts, My Posts, My Subscriptions, and for administrative users, Statistics and Banned Users. The Recent Posts tab shows all posts from all categories by date, so you can keep up on all the most recent discussions in the message boards. The My Posts tab shows all of the posts for the user that is currently logged in. This is a convenient way to get back to a previous conversation in order to retrieve some pertinent information. The My Subscriptions tab allows a user to manage thread subscriptions. If you lose interest in a particular topic, you may want to visit this tab and unsubscribe from a thread. For administrators, the Statistics tab shows the number of categories, the number of posts, and the number of participants in your message boards. It also has a list of who the top posters to your message boards are. The Banned Users tab shows all of the users who have been banned from posting on the message boards. To post a new thread simply select the Post New Thread button. You will see a message editing form. The body field on this form is different from that of the other portlets in Liferay. The reason for this is to support BBCode, which is a standard form of markup used in many message board products. Before BBCode was invented, many message board products would allow users to enter HTML to format their messages. This, however, enabled attackers to insert malicious code into the message board. BBCode was invented to provide users a way of formatting their messages without allowing them to enter HTML. Similarly, Liferay supports BBCode in the message boards portlet because the other editor–which is used for the Content Management System, the Blogs portlet, and other portlets–produces HTML. This is appropriate for those other portlets, as they are only used by privileged users, but it is not appropriate for the message boards. Besides this, many users of message boards are familiar with BBCode and are used to it, and the editor that is provided for Liferay’s Message Boards portlet makes it very easy to use. The message boards editor is quite rich. It supports bold, italicized, underlined, and crossed-out text, links, images, colors, lists, tables, alignments, quotation blocks, code blocks, different fonts and font sizes, and more. There are even a bunch of smiley faces that you can use. Users who have Moderator access to the board can modify the priority of messages. You can also use the editor to quote from messages that you are replying to, to insert emoticons, to add preformatted text, and more. Messages that are posted to the message boards are shown by default in a threaded view so that replies are attached to the proper parent message. This makes it easy to follow along with conversations. When viewing a message board thread, users are given several options. At the top right of the thread are three icons, allowing users to view threads in a flat view, in a tree view, or in a combination view. A flat view shows all of the messages in the order in which they are posted. A tree view shows all of the messages in a threaded view, so that replies are next to the messages they are replying to. A combination view shows the threads at the top as subjects only, with the flat view underneath. When viewing a thread, users can click links allowing them to post a new thread, subscribe to the thread they are viewing, or if they have administrative access, lock a thread or move a thread to another category. Subscribing to a thread causes Liferay to send the user an email whenever a new message is posted to the thread. If you have enabled the mailing list feature for the category in which the thread resides, users can simply reply to these messages in order to post back to the thread, without having to visit your site. 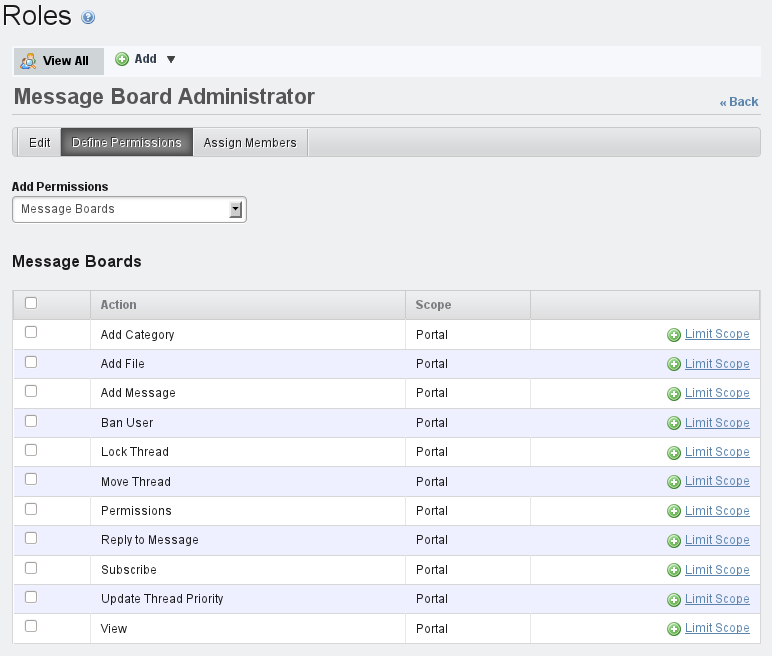 The Message Boards portlet is also highly integrated with Liferay’s user management features. Posts on the message board show users’ pictures if they have uploaded one for themselves, as well as the dates that users created an ID on your site. 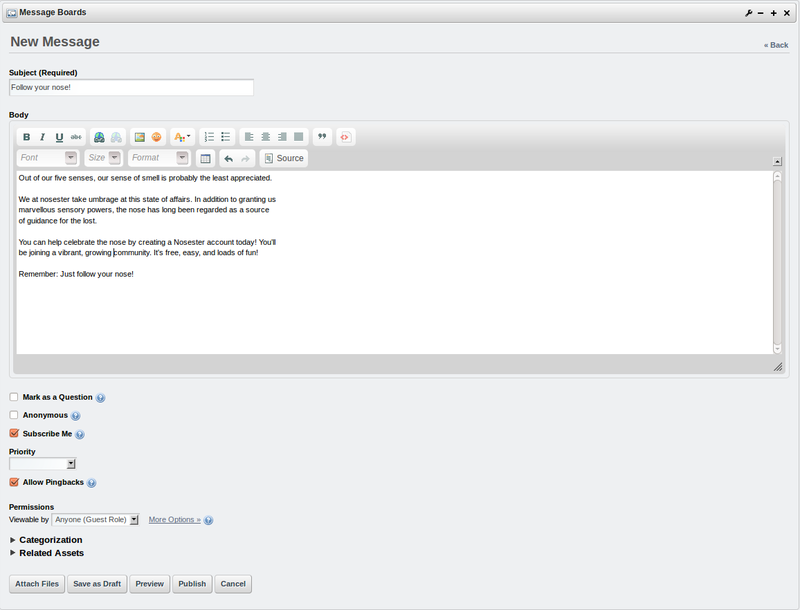 The Message Boards portlet provides for the day to day administration of the message threads. You may wish to separate this function out by a role, and then delegate that role to one or more of your users. That would free you up to concentrate on other areas of your web site. To do this, you can create a role called Message Board Administrators. This role can be scoped by the portal, an organization, or a site. If you have a portal scoped role, members of this role will be able to administer any Message Boards portlet in the portal. If it is an organization or site scoped role, members of this role will be able to administer a Message Boards portlet in only the organization or site which assigned the role to them. Go to the Control Panel and create this role. Once it is created, click Actions → Define Permissions. Click the Add Permissions dropdown list. Browse the list until you find the Message Boards portlet under the Site Content section and then click on it. You will then see a screen which allows you to configure the various permissions on the portlet. Select the permissions you would like message board administrators to have and then click Save. You can add users to this role and they will inherit the permissions. Message Board administrators can perform all of the functions we have already presented, including creating and deleting categories and posting threads. In addition to these, a number of other functions are available. Many times a user will post a thread in the wrong category. Administrators may in this case want to move a thread to the proper category. This is very easy to do. You can select the Actions menu to the right of the thread and choose Move Thread. Or, if you are already viewing the thread and you have administrative access, there is a link at the top of the thread labeled Move Thread. Click this link. You will be presented with a simple form which allows you to select a category to which to move the thread and a check box which allows you to post a message explaining why the thread was moved. This message will be posted as a reply to the thread you are moving. When finished, click the Move Thread button and the thread will be moved. Users with administrative access to the message boards can delete threads. Sometimes users begin discussing topics that are inappropriate or that reveal confidential information. In this case, you can simply delete the thread from the message boards. This is easy to do. First, view the list of threads. Next to every thread is an Actions button. Click Actions → Delete to delete the thread. This does not prevent users from re-posting the information, so you may need to be vigilant in deleting threads or consider the next option. Unfortunately, sometimes certain users become abusive. If you wind up with a user like this, you can certainly make attempts to warn him or her that the behavior he or she is displaying is unacceptable. If this does not work, you can ban the user from posting on the message boards. Again, this is very easy to do. Find any post which was written by the abusive user. Underneath the user’s name/profile picture is a link called Ban this User. Click this link to ban the user from the message boards. If after taking this action the user apologizes and agrees to stop his or her abusive behavior, you can choose to reinstate the user. To do this, click the Banned Users tab at the top of the Message Boards portlet. This will show a list of all banned users. Find the user in the list and select Unban this User. Sometimes a thread will go on for a while and the discussion completely changes into something else. In this case, you can split the thread where the discussion diverges and create a whole new thread for the new topic. Administrative users will see a Split Thread link on each post. To split the thread, click the link. You will be brought to a form which allows you to add an explanation post to the split thread. Click Ok to split the thread. Administrative users can edit anyone’s posts, not just their own. Sometimes users will post links to copyrighted material or unsuitable pictures. You can edit these posts, which allows you to redact information that should not be posted or to censor profanity that is not allowed on your message boards. Permissions can be set not only on threads, but also on individual posts. You can choose to limit a particular conversation or a post to only a select group of people. To do this, click the Permissions link on the post and then select among the Delete, Permissions, Subscribe, Update, and View permissions for the particular role to which you want to grant particular access. This function can be used, for example, to allow some privileged users to post on a certain thread, while others are only allowed to view it. Other combinations of the above permissions are also possible. Next, let’s discuss Liferay’s Wiki portlet.